Important Update to Email Invitation Footers – Checkbox Survey Inc.
On January 29th around 6am EST, we will be putting out an update to rename the merge codes seen above to include the word "Footer" before each name label. So @@Company will become @@FooterCompany, and so on. We will also be running a script on all Checkbox Online installations to change all the "old" merge codes over to the new merge codes. This is being done because an oversight in the development of this feature has allowed the address fields in the footer to potentially have the same names as user profile fields. This can result in user information being incorrectly merged into the email invitation footer, rather than company mailing address information. The script we will be running on January 29th is basically a massive "Find and Replace" - all the old merge codes (using the fields above) that are found in existing invitations and reminders will be replaced with the new "@@FooterCompany", "@@FooterCity", etc. merge codes. This is a good thing for your email footers because it ensures they work properly. However, if you have user profiles with the exact same names as the fields above, those user profile merge codes will also be overwritten in any existing invitations. For example, let's say you set up a user profile field in your System Settings area called Company and you populate that field with the companies of all your users. 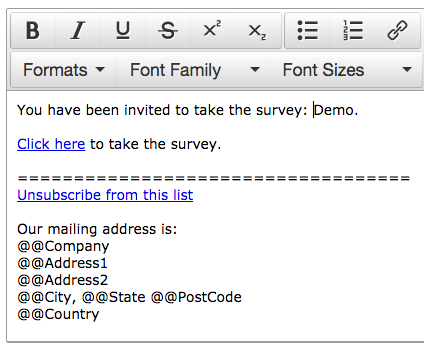 Then, to personalize your invitation, you merge the Company user field into your invitation message. When we run our script, the merge codes in your invitation message will also be updated from @@Company to @@FooterCompany, which means that your organization's company name will be merged in when you send your invitation or reminder. This is ONLY an issue for invitations or reminders that exist prior to when we run the script on January 29th - new invitations and reminders created after the script is run will not be affected. What do I need to do to make sure my invitations work? If you have existing invitations or reminders that are scheduled or that you are planning to send after January 29th, you will want to open them up after our update but before you send them and make sure that you don't have any merge codes that start with @@Footer in the body/message of your email. If you do, delete those merge codes and re-add the merge codes for the correct user profile fields. We would also recommend sending a test invitation for any existing invitations or reminders before you send them live to your respondents. We do apologize for this inconvenience and welcome any comments or questions you may have through our support system. In addition to the footer updates, the January 29th update will include performance enhancements that should speed up the application, especially for large surveys.